For our girls' trip in January, I was able to use a stroller from Simple Stroller Rental and it was a lifesaver! On this vacation, I flew by myself with my two girls, ages 3 and 19 months. We currently own more strollers than I really care to admit but none of them would both work for two kids and be easy for me to gate check with the children and other gear in tow. Thankfully, I connected with Simple Stroller Rental and was able to fly with just my smallest umbrella stroller, knowing a comfy full-size double would be waiting for me at Old Key West. I had a direct flight to Orlando and if my youngest had been a little older, we would not have taken a second stroller at all. On the morning of our flight, I received a text message from Simple Stroller Rental letting me know that my stroller had been delivered to Old Key West and wished me a good trip. So before I was even at the airport, I knew we were all set. Yay! One more thing off the mental checklist. When we arrived at Old Key West, I saw a couple of strollers waiting for their families near the Bell Services storage room. After checking-in, buying groceries and dinner, and borrowing DVDs, I asked the bellman for my stroller. One big click (the stroller opens really easy) and a small tip later and we were off to the room. Both of the girls wanted to hop in right away. The City Mini Double was pretty easy to deal with on Disney transportation. First, the fold could not be simpler. All you do is grab the two handles in the back of the seats and pull up quickly. It folds fairly flat and can stand alone. It's over 25 pounds but neither Amy S. or I had any trouble getting it on or off of buses. When we took it to Downtown Disney on a boat from Old Key West, the captain just asked me to store it up front. Again, simple. When loaded with two children, it took two of us to get the stroller on and off the monorail, but no big deal. It was also narrow enough to go through every doorway we encountered and I didn't have a problem getting through any stores either. It also folded small enough to tuck it away between a bed and the wall in our room to save floorspace. My only complaint about this stroller is the basket. It's a large basket but hard to access so you won't be able to put a diaper bag under there. I added my own hooks to the handlebar. I know you aren't supposed to do that but we didn't have a very heavy backpack and never had any issues with tipping. I also added a brightly colored luggage handle cover to the stroller to help us spot ours in the stroller corrals. You won't be able to leave anything in the basket when you fold the stroller so make sure you have somewhere for your stuff to go. I carry a small tote bag that packs into its own tiny bag so that we have a quick place to shove jackets, etc when it is time to get on the bus. I was given a raincover for the stroller but the weather was nice and we didn't have to use it. It's only $10 for the entire length of the rental and we all know you could certainly get your money's worth during some times of year in Florida. Simple Stroller Rental includes the parent console with their strollers so you have a place to carry your beverage or other small items. Ours was a Bob-branded one but fit well and had two cup holders and a zipper pouch. I keep napkins there for quick access. At the end of the vacation, we returned the stroller to Bell Services and Simple Stroller Rental picked it up later that day. It just could not have been easier. I reserved my stroller back in September and found their website to be a breeze to use. I've had a question or two and the customer service was great. The stroller was very easy to use, but instructions were included just in case we had any problems. Having a double stroller so perfectly suited to Walt Disney World was terrific. Basically, I am a very happy customer! 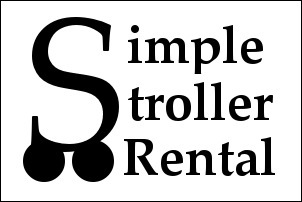 Many thanks to Simple Stroller Rental for providing us a stroller for this review! Please check out their site to browse the single and double strollers available for rental during your next Walt Disney World or Central Florida vacation. 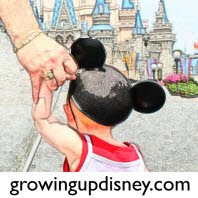 Use code "growingupdisney" for a 10% discount! Disclaimer: This post now includes affliate links.